Though the gender-coded soul-body dynamic lies at the root of many negative and disempowering depictions of women, Sarah Johnson here argues that it also functions as an effective tool for redefining gender expectations. Building on past criticism that has concentrated on the debilitating cultural association of women with the body, she investigates dramatic uses of the soul-body dynamic that challenge the patriarchal subordination of women. Focusing on two tragedies, two comedies, and a small selection of masques, from approximately 1592-1614, Johnson develops a case for the importance of drama to scholarly considerations of the soul-body dynamic, which habitually turn to devotional works, sermons, and philosophical and religious treatises to elucidate this relationship. 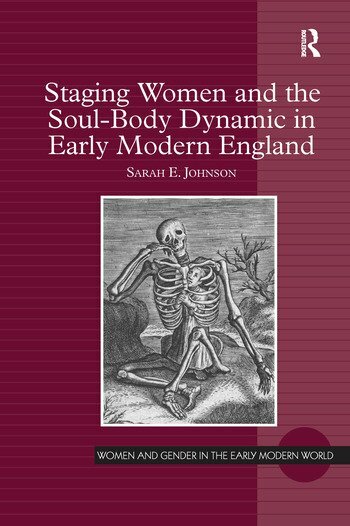 Johnson structures her discussion around four theatrical relationships, each of which is a gendered relationship analogous to the central soul-body dynamic: puppeteer and puppet, tamer and tamed, ghost and haunted, and observer and spectacle. Through its thorough and nuanced readings, this study redefines one of the period’s most pervasive analogies for conceptualizing women and their relations to men as more complex and shifting than criticism has previously assumed. It also opens a new interpretive framework for reading representations of women, adding to the ongoing feminist re-evaluation of the kinds of power women might actually wield despite the patriarchal strictures of their culture. Sarah E. Johnson recently completed a Social Sciences and Humanities Research Council of Canada Postdoctoral Fellowship at Queen’s University. She is currently teaching as an Adjunct Assistant Professor at Queen’s University and The Royal Military College of Canada and is at work on research exploring pride and gender in early modern literature.